This post was written in exchange for books from Kate's Growing Readers & Usborne Books; however, all opinions are my own. As a teacher, a question I hear time and time again from parents is, "How can I help my child to enjoy reading"? While I do not claim to have all of the answers (not even close), I do know that engaging with texts from a young age is certainly a good starting place for setting your child up for a future relationship with them. That being said, I thought I would take a moment to share with you all today some things that I am working hard to do with my little (as a mama and teacher) to set the stage for what I hope is a lifelong love for reading. 1. Make books accessible. We keep books in multiple locations. Asher can access them in his room, in the living room and even the car, for that matter. It is important to me that he is able to select texts at his leisure without having to wait for mom or dad to get them for him. You wouldn't believe how much it makes my mama heart flutter when I walk in a room to see he has picked out a book himself, and he is joyfully reading along in his own little way. 2. Read frequently throughout the day. While we certainly have those routine times of the day where we always read, like bedtime, we also try to find other times throughout our day to make reading a priority. For instance, in the summer, we took time each afternoon to head out to our front porch and read a few books in the sunshine. Now that it's a bit cooler, we enjoy simply lying down together on the rug or snuggling up in Asher's rocking chair throughout the day to indulge in a few stories together. I imagine as we get ready to put up our Christmas tree here in just a few short weeks, that will provide us with another cozy locale for a few daily delights as well. Research has shown time and time again that the absolute best way to foster reading skills is by reading. Fancy that - the more you read, the stronger reader you become! 3. Don't force it. I think this goes back to really being authentic with your child's reading experiences. As adults, we generally don't continue reading a book if it isn't "fun" anymore. The same should and can be modeled for kids. It is okay to abandon a book if it has moved from being enjoyable to a drag - or in a toddler's case - a kicking, screaming arm wrestling match. If you have to abandon a book midway through - it is what it is. At the end of the day, I want him to remember his experience reading being a joyful one and not one where he felt forced to participate. 4. Let them choose. Even our littlest friends are capable of beginning to make choices. I want Asher to be able to be invested in our reading ventures, and one of the ways I make that happen is by giving him a choice in books to read. I will often present him with 2-3 books at a time and ask him to pick one (he will generally just grab or point at this stage), and then the one he selects is the one we will dive into. Not only is this giving us the chance to read something that interests him, but shows him that he has a voice and opinion, and it matters. To take this point a bit further, I love it even more when Asher actually picks out a book himself and brings it over to me to read at any given point throughout the day. Whenever possible, I make it a point to stop what I am doing to be present in that moment to continue to ignite that desire he is demonstrating. 5. Read a variety of texts. I recently heard that as parents we should do our best to read one favorite, one familiar and one new book with our kids each day. This makes a lot of sense to me, as I know that those familiar reads bring comfort and confidence, while those new texts present an opportunity for new content and new vocabulary. So as much as possible, I work to do this throughout our day. We have our favorites - which are basically books about anything with wheels at this point. We have a particular love for buses, so Usborne's Baby's Very First Bus Book, which even comes with spinning wheels I may add, is a huge hit right now. We also have a variety of familiar books, many being those classically told children's stories. And then finally, we take a trip to the library every other week or so to pick out our new books. The neat thing about the library is there is an incredible array of texts at your fingertips for free! And I don't know about you, but I remember going to the library as a kid and just being overjoyed with the possibilities in store. Right now, we currently are just overjoyed by pulling as many books as possible off of the shelves...but hey we've got to start somewhere. 6. Get them involved in the text alongside you. We are huge fans of interactive texts around here. If it has flaps, doors and textures - sign us up. One of our recent favorites is Usborne's All Better book, where there are a variety of animal favorites that seem to keep getting hurt. It teaches kids the routine of "clean it, kiss it and bandage it" while actually providing these adorable reusable bandages for them to stick on each animal's ouchie. I mean, seriously, does it get any cuter? Books such as these gives kids at this age a very concrete way of getting involved. Plus, it gives them an opportunity to hone in on those fine motor skills. But let's be honest, books don't even have to have all of these bells and whistles to get your child involved. Have your child turn the pages for you, or when they are able maybe they are in charge of reciting a specific part. Whatever it may be, make them an active participant in the experience as much as you can. 7. Connect texts to real life. Whenever possible, work to connect what you and your child are reading together to their real life environment. For instance, if we are reading a story about "brushing teeth", I may grab Asher's toothpaste and toothbrush and show it to him simultaneously. If we are going to visit the zoo, then we may read a book about the animals we will see in the morning, have the experience, and then when we return we may review the book again to point out those we did see. Asher also absolutely loves those "first words" type books, because he constantly sees pictures that are familiar to him from his environment. One that we are loving right now is Usborne's My First Spanish Word Book. He can't get enough of pointing to the dog and saying "woof" or looking at the body parts and working together to locate them on his own body. Connecting texts to real life gives kids the opportunity to see from a young age what a powerful learning tool reading can be. 8. Make it sound fun! 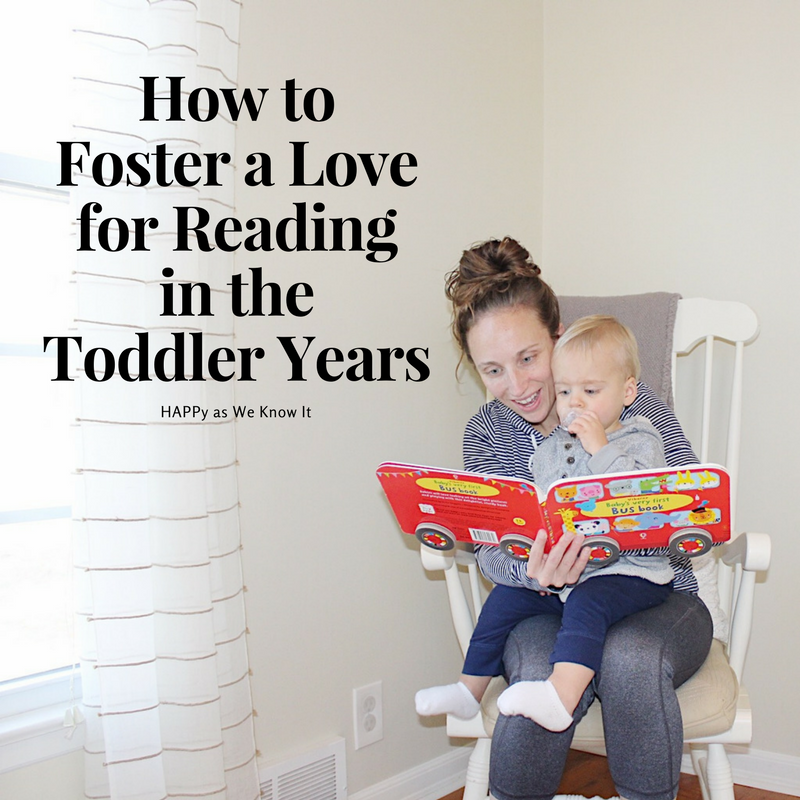 So this one may come as a shock to you, but the more fun you have while reading with your toddler, the more fun they are likely to have as well. So don't be afraid to get a little goofy, get into character, and even sing through the book if you so choose. Not only are you modeling good reading habits then in general, but you are modeling the joy that can come alongside a great book. And that my friends, is contagious. If you are interested in seeing any of the other texts that Usborne Books has to offer, I would encourage you to check out the site Kate's Growing Readers. Kate would be more than happy to chat with you as well to discuss your family's specific interests and needs and continue the conversation about developing life-long readers.